The envelope carts are an interesting addition. When getting a special shape, one thing nobody ever counts on (when you never have worked on a Special Shape) is the weight. 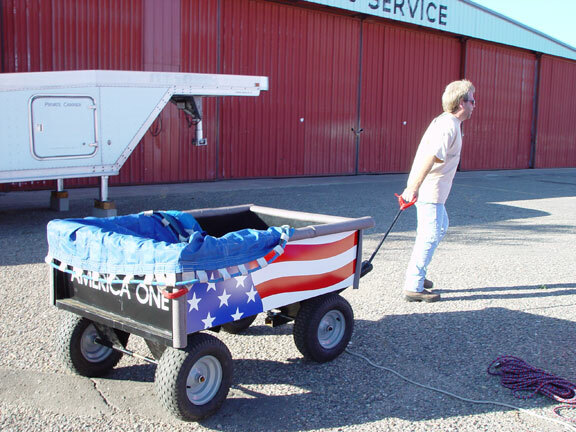 The US Flag Balloon "America One" weighs 550 pounds. Space Shuttle "Patriot" weighs 997 pounds. That means serious movers are required. Originally, we were going to have to build custom carts for moving these mammoths. Then, I discovered something that could be modified to work from TSC, Tractor Supply Company. I love Tractor Supply Company. Both carts have served us well, look nice and have big tires to get through difficult turf. This is an adjustable cart that could be up to 6'x4' that is no longer adjustable. The sides originally could be unhooked, making a flatbed type trailer. The problem was that the sides were not strong enough to hold in the Shuttle bag. So I had to weld the sides solid and I ran 1" square tube around the top, securely welded in place to add reinforcement. The sides and floor are wire mesh, which is too abrasive for the fabric bag. The floor has a form fitted painted plywood floor with custom lettering that says "Place Spacecraft Here". 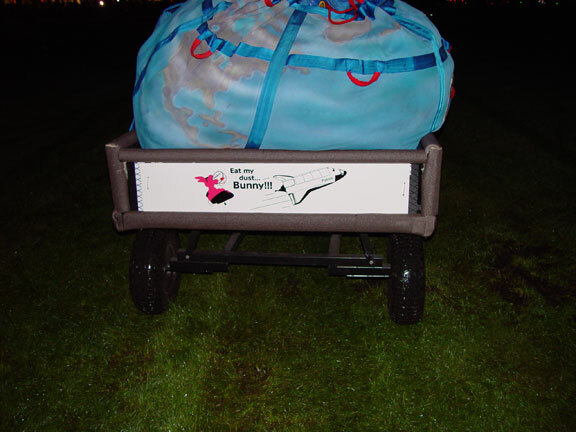 The sides have PVC plastic inserted up against the wire and lettering on the sides "Transporter-Crawler", which is what the machine is called that take the real Orbiter to the launch pad. The PVC plastic says "I Brake For No One" because this cart has no brakes. Get in its way, it shows NO forgiveness. The rear is a spoof about the ongoing battle we have with the Energizer Bunny for who has the tallest balloon. This trailer has a 2000 pound weight capacity and doesn't even flinch with the Shuttle on board. This cart is actually labeled a "Garden Wagon" and the rear door was removable. The dimensions are 3'x5'. It was welded securely in place because the Flag Bag would have just pushed out the sides since the back wasn't connected. Teri then lettered the entire cart with a flag on the sides and the warning "I Brake For NO One" on the front and back. If you get in the way as this cart is rolling, it "Brakes for No One". You will be hurt. 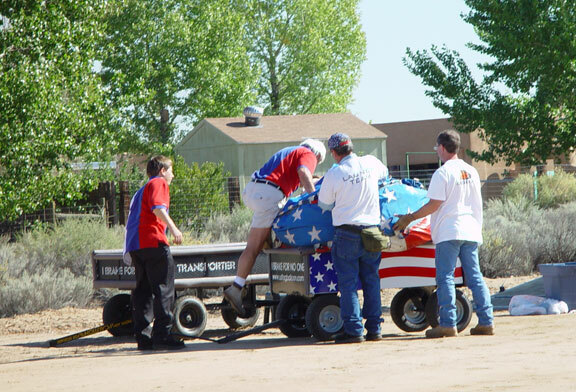 It has a 1000 pound capacity and after having a couple crew people on the cart with the balloon, we have exceeded the maximum weight of the trailer. That collapsed part of the floor but I have since brought in back into the shop and welded new reinforcements to keep it from collapsing to the wheels. . No problems NOW! 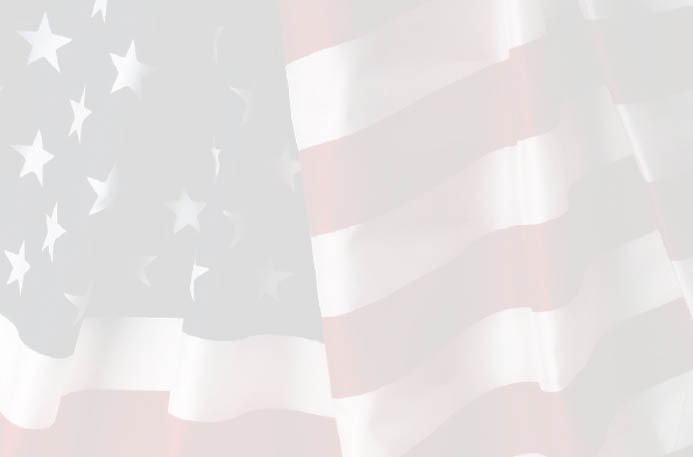 Copyright � 2002 Theresa C. DiLibero.